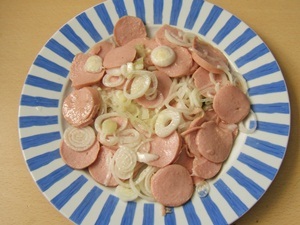 Knackwurst Salad: perfect summer dish, wuickly made and "zünftig"
When the temperatures are rising, and people prefer to spend their time outdoors: cycling, tending the garden, having a swim or climbing a mountain, then the time of summer dishes starts: cold dishes. We have already presented some of the typical spreads, which play a big part when having "Brettljause" or "Brotzeit". Yet, in Austria there are many more summer dishes, and it is best to enjoy them al fresco. If you savour your summer dish in front of an Alpine Chalet looking at the wonderful mountains surrounding you, or having it for picnic in a park, on a sun-warmed wooden dock at a lake or under the shadow giving branches of a chestnut tree in a beer garden. Our collection of summer dishes starts with a very special salad, we would say a Man's salad: Essigwurst. Essigwurst would be translated to "vinegar sausage" and can be described as pickled sausage with onions. 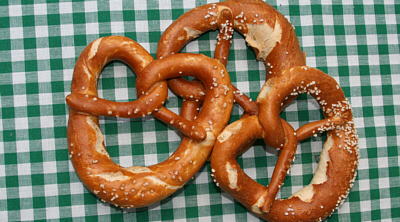 The Austrian vinegar sausage is perfect when watching football, tennis or the Olympic games. It is insofar a salad as you eat it cold and it contains vinegar, sometimes it is referred to as "sour sausage". 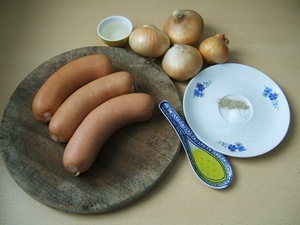 If you serve vinegar susage as main dish use one Knackwurst per person. If knackwurst is not at hand – we are discussing alternatives to this very typical Austrian type of sausage a bit further down. The preparation of this dish is as easy as the number of ingredients conveys. Take of the skin of the sausage, cut the sausage in small slices, best done with a slicer. Cut onions. Arrange onions and sausage on a plate marinate with vinegar and sausage and add salt and pepper. Serve and enjoy. About vinegar and oil: the classical vinegar in Austria is Hesperiden-Vinegar, a vine vinegar with apple juice. The oil to use would be either sunflower oil or corn oil. The Essigwurst is very delicious with Styrian pumpkinseed oil and mild fruit vinegar. 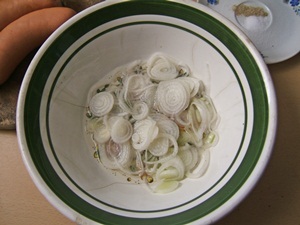 My special touch for this dish: I do marinate the onions: I start preparing the dish by slicing the onions, making the vinegar-oil marinade and mixing marinade and onions. There are people who don't like raw yellow onions, us the sweeter red onions or spring onions. If you are on vacations in Austria or Bavaria it is very easy to get hold of the ingredients. 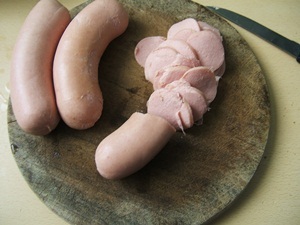 Yet, if you are further away it might get tricky to get hold of Austrian type knackwurst (called Knacker). What you have to look for is a sausage similar to wiener, yet a bit bigger, if wiener is all you can get hold on, this is fine as well. Another alternative would be sausages bologna type. 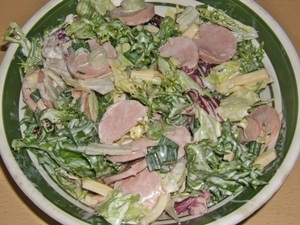 It ain't a long way from Austrian Essigwurst to Swiss Sausage Salad (Schweizer Wurstsalat). To prepare this special Swiss dish you need as well a few slices of cheese (Gouda or Emmenthal style), to cut in stripes, some salad, and if you like it add radish and gherkins. The dressing for Swiss salad is a little more elaborate than for Austrian vinegar sausage: make a yogurt dressing with two spoon full of yoghurt, vinegar, oil and fresh herbs (like chives and parsley).